Thank you for taking the time to explore our website. Please take a few minutes to learn about our beautiful solutions and our distinct processes. Browse through the gallery and read our customer testimonials. We hope you are able to feel the passion that our entire team has for creating beautiful and functional kitchens! We (Jeff and Raffi) began renovating kitchens in the fall of 2009. 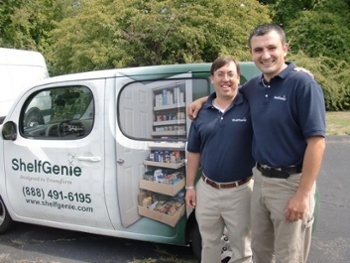 We currently operate both Shelfgenie and Cabinet Cures across eastern Massachusetts. In past lives, we worked together at Capital One, where we were part of the founding team of Capital One’s Home Improvement Financing Business. Most jobs are finished in 5 days or less. Small jobs may only take 2–3 days. Your design consultant will support you throughout the entire process, from original consultation to final walk-through. While at Capital One, we saw a lot of home improvement businesses that we didn’t particularly like – either the products that were sold, or in the way that the company treated its customers. At the time, we said that if we ever found a home improvement business that could offer a truly custom solution, and do it in a way that treated the customers like we would want to be treated, we would go into business together. After an extensive search, we chose to become ShelfGenie franchisees with a singular focus on delivering a great customer experience from the first design consultation to the final installation step. Our ability to deliver more space, easier access, better organization to kitchens across Massachusetts – and to do so in a way that consistently thrills our customers has enabled us to transform over 1,300 kitchens in less than five years. Early on, we realized something was missing. At the conclusion of the Shelfgenie projects, several customers asked how we could help them make their kitchens more beautiful. After a second extensive search, we found Cabinet Cures. Kelly Koch, the founder of Cabinet Cures is – hands-down – the best finisher we have seen in the country. The proprietary water-based stains, combined with processes refined over the course of 30 years creates a product that is truly breathtaking. Today, we are able to offer our customers beautiful and functional kitchens that completely meets their needs. Along with our dedicated team of Designers and Installers, we provide the best end-to-end customer experience. All for a fraction of the cost of a new kitchen, and all within a five day period. Please give us a call so that we can help make your kitchen dreams a reality.